How to really enjoy the ride. 1. You need balance. If you lean too far to one side, you’ll fall off. It’s important to always pay attention to where you’re leaning. 2. Get back up again! It’s not falling down that determines your worth; it’s whether or not you get back up. 3. In the beginning you stumble, but with more experience you can really get far! Life is a series of learning from your mistakes. That’s how you learned to walk and talk. And it’s how you grow in life. 4. If you look at the ground instead of looking up ahead, you’ll lose your balance and crash. In life, it’s easy to live in your own little bubble, consumed with yourself. You not only disconnect from the world, you ultimately disconnect from yourself. Look up and outside yourself. Connect to the world outside of you. Only then can you flourish. 5. When the road throws you a curve, go with it! When a turn is coming up, you lean with the curve. You don’t fight it and go the other way. Life sometimes throws you curves too, and in order to remain on top, you need to go with the flow. If a tragedy happens, accept its pain, and go with God’s larger plan which is for the ultimate good! 6. A bike helps you get to where you need to go. Some people ride bikes just for the thrill of it. And some people believe that life just for the thrills. They don’t realize they have places to get to. A bike is a tool – it’s not the end goal. You’re supposed to get to someplace with your life. Be clear on your destination, and if you use it well, you can really get far! 7. A bike doesn’t move on its own. Life and bicycles need people to operate them. Without a person behind the handlebar, guiding and making choices, it just won’t go anywhere! 8. When you get really good, you can do wheelies! After you’ve been riding a bike for so long, you can start doing the special stuff. Life is like that also. Once you get the hang of who you are and where you’re going, you can pop some big miracles too! 9. Bicycling gives you muscles. Life toughens you up, especially if you ride up hills. 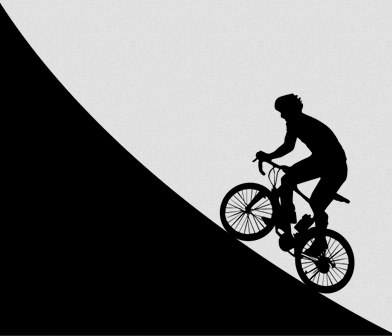 Riding down a hill may be fun and exciting, but only riding up the hill strengthens your muscles. 10. You can’t do it forever. Some people wish they could live forever. Some people believe it. 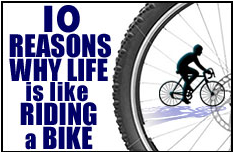 But just like riding a bike, your body eventually wears out, and you need to go home. The important thing is that you enjoy the ride, and you get to where you need to go! My friend sent me a link to this video. It was worth the 2:42 to watch. Everyone can learn something from this. This Journey is about connecting to the power you hold inside and riding strong…building Endurance. Bom Bom (Radio Edit) – Sam and the Womp (2:54) 65 RPM – Warm up – use this time to loosen your joints and warm your body. Make sure your bike is connected to the road and you are pushing your pedals to move. Take a couple of easy turns to increase resistance. Especially when it is cold outside you need to take time to warm up. The warm up is essential for working hard later. Don’t Stop the Party – Pitbull (3:26) – 65 RPM – 1 leg drills – Make a strong connection to the pedal stroke. Even, smooth and fluid. One minute right leg, one minute left leg. Turn up resistance and then hold both legs turning with a strong pedal stroke to the end of the song. Someone Like You – Adele (4:45) – 65 RPM – slow pedal stroke and increase resistance. Take 8 small turns to get to the top of the hill. Make it turn gradually into a heavy standing climb. Ride (Tiësto Remix) – Cary Brothers (7:05) -65 RPM seated false flat endurance– increase resistance until you reach your threshold. The point at which mild hyperventilation sets in. Burn in your legs, burn in your lungs, can only control the rhythm of your breath with focus. Close your eyes and feel your body working from the inside. Feel your body getting stronger. Hold on and allow the burn to make you work harder. 9 Minute Climb – this is a climb you need to wrap your mind around to make it to the top. Ride from your core! The Veldt (Radio Edit) – Deadmau5 (2:50) 65 RPM – start with a standing climb – take a couple of turns to increase resistance then sit and climb – take 4 more increases in resistance. Little Talks – Of Monsters and Men (4:27) 50 RPM – standing climb – speed surges (o-0:15) (0:55-1:14) (1:50-2:29) (3:05-3:44) Hold the resistance and burst out of the saddle with speed. Slow pedal stroke as much as needed between each speed surge but stay standing. On the last interval, give a little increase in resistance at 3:20. This song was chosen as the number one song for 2012 on iTunes. Ho Hey – The Lumineers (2:43) 70 RPM- heavy climb in 3rd – move your hands into position 3, stretch out your upper body with your chest low. Turn up the resistance as much as you can take it. This is the top of the hill. Find a little struggle. This is the number one album on iTunes for 2012. Catch My Breath – Kelly Clarkson (4:12) 65 RPM- seated flat road with power intervals – turn resistance up for each interval and power through to lose your breath so you can “Catch your Breath” at the end of the interval. (0:46-1:18) (1:48-2:18) (2:48-3:50). On the last interval, take a second turn at 3:20 and stand to finish the song. Last Train to Lhasa (Live) – Banco de Gaia (7:08) – 55 RPM – Endurance – Find your threshold, hold your cadence, get down and ride powerful. This song is like a drug…cyclists don’t need dope, they need music! Be strong and push through until 6:30. This song can be done seated or standing. I like to leave it up to the rider to change positions as they feel. It is one of the best songs to lose yourself into the music. 93 Million Miles – Jason Mraz (3:36) 70 RPM – start standing climb, take 2 out of 7 turns up standing to set the climb and power. Hold momentum and sit. Take note of your form, soften the upper body. You are getting tired and so it is important to focus on your form. 7 turns to the end of the song. Take the 7th turn as the music changes. Daylight – Maroon 5 (3:46) 60 RPM – Standing climb/Sit on chorus (0:36-1:08) (1:42-2:14) (2:33-3:38) . The last interval take a turn up at 3 and stand to crest the top of the hill. Faster – Matt Nathanson – (3:28) 50 RPM – Road Speed – make it a strong fast finish. Give a couple of turns of resistance to keep pushing to the end but don’t slow down. This Journey is about being aware of the different efforts that you can work at. We call this Rate of Perceived Effort (RPE). For information on the different Heart Rate Zones and RPE click here. Be true and honest about your effort level. You will see results. You Shock Me All Night Long – AC/DC – (3:32) 65 RPM – Feel 65 RPM and begin to warm up. Feel the whole circle of the pedal strock 360 degrees and bring your awareness inside to feel your body moving at 65 RPM. This is the speed where all the work happens in this journey. BTW, there is no playing AC/DC quiet, blast the volume. Burn it Down – Linkin Park (3:51) 55 RPM – take your resistance up high into a heavy climb – hands in 3rd position, tail bone back over the saddle. 50 Ways to Say Goodbye – Train (4:07) 76 RPM – Intevals – start jogging on each interval, sit and pick up speed. Option to add resistance after each interval. Intervals of 25/30/55 at (0:45-1:10) (1:57-2:24) (2:58-3:54). Sound of the Drums – DJ CHUS & Abel (7:44) 65 RPM – Ladder Drills Seated – It is important to be true and honest about each effort level. Start pedaling to the beat, find the rhythm. We are going to start with a perceived effort level of 7/10 hold for 2 mins (0:45-2:45), then 8/10 for 2 mins (2:45-4:45), 9/10 for 2 mins (4:45-6:45) and 10/10 for 1 min (6:45-7:45). Semi-Charmed Call – Mashup – Third Eye Blind vs Carly Rae Jepsen ( 3:36) 57 RPM – This is a recovery. Take as much recovery as you need. When it starts to feel better. Add a little resistance and jog. At 1:05 small increase in resistance. At 2:00 give it a big increase in resistance to slow legs down to the slower speed of the music. This song is not on iTunes so you have to get it from Youtube site click here or from the bootiemashup website click here. Ride (Tiesto Extended Remix) – Cary Brothers (7:05) 65 RPM – Back to Ladder Drills – Be true and honest about your effort level. Settle in with the rhythm right away. First time through seated, second time through standing. Seated find 8/10 RPE (0-1:00), 9/10 RPE (1:00-2:00), 10/10 RPE (2:00-3:00), Ease resistance but keep pedaling (3:00-4:00), Stand up and jog 8/10 RPE (4:00-5:00), 9/10 (5:00-6:00), 10/10 (6:00-7:00). I love this song to ride to. One of my favourites. It has a good strong beat and catchy tune. Easy to get lost in the rhythm. Americano/Dance Again – Glee Cast ( 3:35) 65 RPM – Recovery – take as much as you need. When you feel better, give it some resistance and jog it out. Good strong beat to jog to. Keep it light. Tabata Intervals – (4:02) 72 RPM – There are lots of options for Tabata Intervals to be found. Click here for a few to pick from. I personally liked the “Coached” ones where the music is queued out for you. 20 seconds all out, 10 seconds recovery, 8 times. Be sure to stick with this. It is hard but High Intensity Interval Training (HIIT) is worth it. For information on Tabata Intervals, click here. We Found Love (Feat. Calvin Harris) – Rihanna (3:35) -65 RPM – Recovery – take as much as you need. When you feel better, give it some resistance and jog it out. Rebellion (Lies) – Arcade Fire (5:10) 65 RPM – Ladder Drills – Next 2 songs are Ladder Drills so think of it as one more time through. This song we will do seated. Seated find 7/10 RPE (:30-1:30), 8/10 RPE (1:30-2:30), 9/10 RPE (2:30-3:30), 10/10 RPE (3:30-4:30), Ease resistance but keep pedaling (4:30-5:10) the recovery for this takes you into the next song. So at the end stand up and jog as the music changes, the beat remains the same. This song was suggested to me by one of my riders. Always great to add songs that people suggest. They so appreciate it and this happens to be a fantastic song to ride to…I have gotten lots of compliments on it. Uprising – Muse ( 5:04) – 65 RPM – Ladder Drills – second of 2 songs on the Ladder Drill. Start standing in a jog. Start at 1:00 and this will have given 90 seconds of recovery since the top of the last ladder. 7/10 RPE (1:00- 2:00), 8/10 RPE (2:00-3:00), 9/10 RPE (3:00-4:00), 10/10 RPE (4:00-4:00). Breakeven/Fast Car – Colbie Caillat (4:05) Cool Down – easy riding to let your heart rate fall gently. Listen to the first line….”Still alive but barely breathing…” This is another song not available in iTunes. You can find it on Youtube here. Skyfall – Adele (4:46) – Cool Down – I love this song. It is a great way to talk about the great new James Bond movie. Have you seen Daniel Craig’s tummy? It’s a great movie and I love James Bond. This ride has had a lot of great feedback and I hope you enjoy it. Let me know what you think. I buy all my music from iTunes. I spend lots of $$$ every time I choreograph a journey. Thanks to my kids who showed me how to do this.